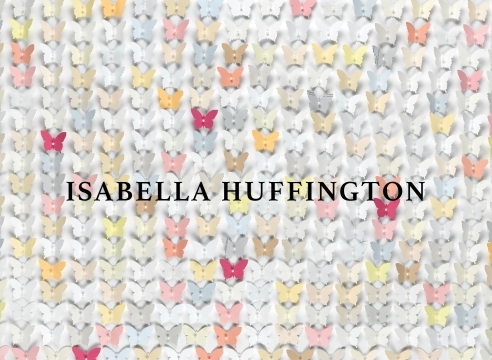 34" x 30" x 1.5"
30" x 40" x 2.5"
Isabella Huffington began making art when she was 15 years old. She graduated in 2014 from Yale University with a Bachelor of Arts degree and debuted her representation with Friesen Gallery in 2015 with an exciting body of collage works on panel. Huffington cites Yayoi Kusama and Keith Haring as major influences. Her works are reminiscent of these two icons; her swarms of images are reminiscent of both organic clusters and feverish hallucinations. 'I like using one idea, like birds or circles, and morphing and stretching it across many different pieces and seeing how it can change and be reimagined,' the young artist explains. Isabella is the daughter of Arianna Huffington, founder of The Huffington Post, and niece of Agapi Stassinopoulos, best-selling author and speaker, both of whom have appeared as speakers at the Sun Valley Wellness Festival. While studying art history I became really interested in the question of art accessibility, and wrote my senior thesis on this theme through the lens of the Crystal Bridges Museum. I’ve always been drawn to everyday materials and processes — sharpies, stamps, stencils, hole punching, and embossing — and inspired by everyday life, which is why I’m so drawn to the pop art movement and its focus on everyday objects. In my collages and mixed media I’ve been drawing on political and cultural events, not in a didactic way, but to capture through my art important moments we’re living through. (Examples are my collages of the eyes of American soldiers killed in the wars of Iraq and Afghanistan, newspaper headlines of mass shootings, covers of magazines that body-shame women, a collage from OkCupid consisting of what New Yorkers are looking for in a date). In my mixed media work I’m interested in using social media (Instagram, Facebook, Reddit, Snapchat) to explore traditional genres — creating a still life from an Instagram photo or a landscape from Snapchat. At the same time in our tech addicted world, where speed is glorified, I want to create art that brings serenity and wonder into peoples lives. Inspired by Buddhist art, particularly mandalas, I use repetition and the exploration of one image or detail, to create opportunities to pause and reflect. I love it when my art evokes in others their own creativity, especially in a world where so many people are afraid to tap into their artistic side. Because I use materials that are so accessible, and that can be found lying around the house, I hope my art can act as an entry point for people who otherwise might be intimidated by fine art. That’s also why I’m interested in elevating “art and crafts” — something we’ve all done as children and that can reconnect us with art later in life. 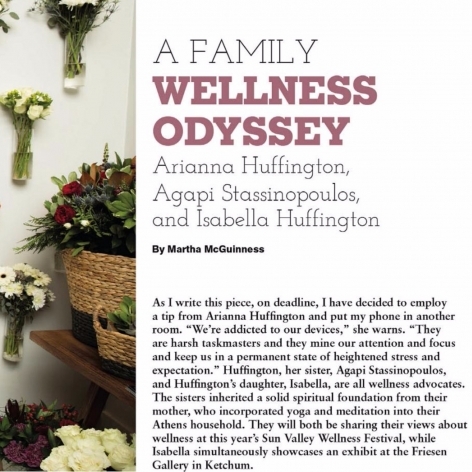 Arianna Huffington, her sister, Agapi Stassinopoulos, and Huffington's daughter, Isabella, are all wellness advocates. The sisters inherited a solid spiritual foundation from their mother, who incorporated yoga and meditation into their Athens household. 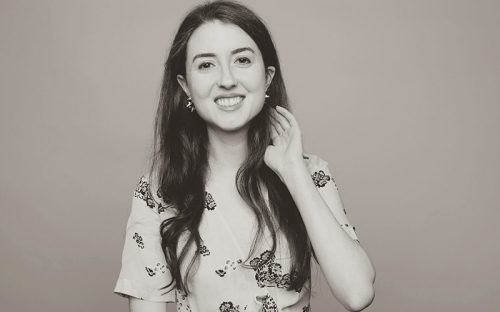 They will both be sharing their views about welness at this year's Sun Valley Wellness Festival, while Isabella simultaneously showcases an exhibit at Friesen Gallery in Ketchum.  . .
Arianna Huffington will speak at the 20th Annual Sun Valley Wellness Festival on Memorial Day Weekend. 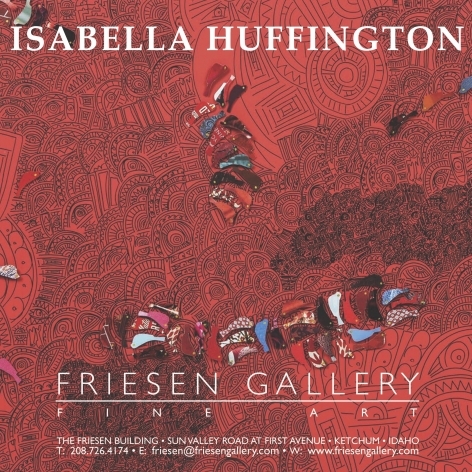 ​Huffington’s sister, Agapi Stassinopoulos, clairvoyant and author of Unbinding the Heart, also will speak, and Huffington’s daughter, Isabella, will exhibit her artwork at Friesen Gallery, 320 1st Ave. N., Ketchum. The show Tiny Beautiful Things will be on display through Saturday, June 10. . .
Isabella Huffington’s Tiny Beautiful Things are like looking at a kaleidoscope. From a distance they resemble colorful kaleidoscopes that appear to be abstract paintings or mixed media pieces made up of extremely detailed geometric patterns. 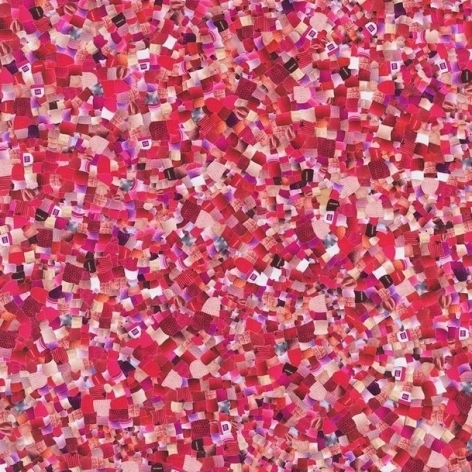 When viewers zoom in up close, they resemble kaleidoscopes filled with exhausting repetitions of tiny pictures of everyday objects like Lincoln pennies and champagne bottles. 'You can get lost in them,' said Gallery Owner Andria Friesen. 'They’re evocative and exquisite.' . . .
Like her media mogul mom Arianna, Isabella Huffington shares a passion for communicating. However, instead of revolutionizing the way we consume news, her preferred medium of breaking boundaries is collage art. 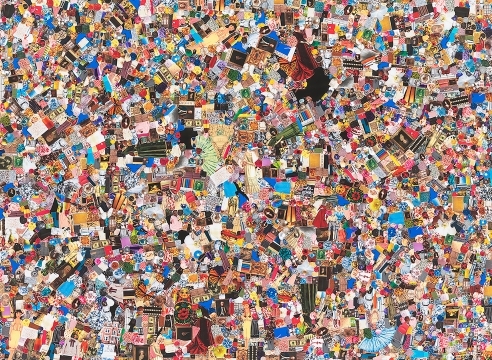 'For most people, the idea of doing an oil painting or a sculpture is very threatening, but the idea of doing collage is something we all did as kids,' says Huffington, who describes her process as 'collapsing the boundaries of fine art and the everyday.' 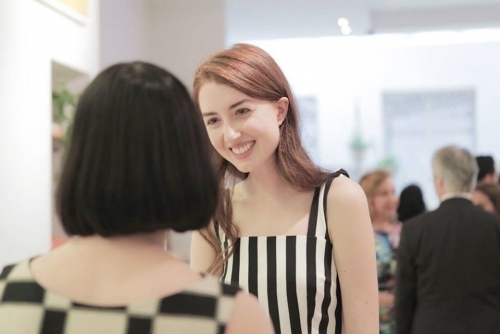 This spring also marks two other milestones for the young artist: Her first solo shows. 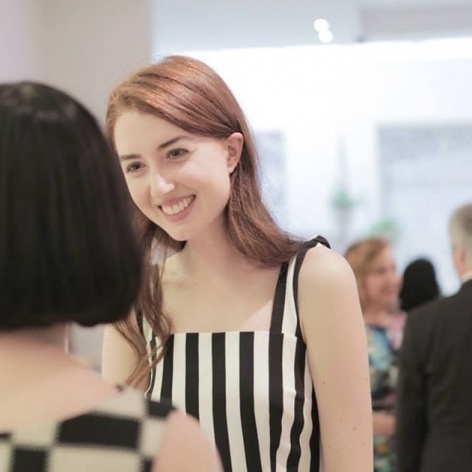 On May 3, her exhibit entitled Women in Politics opens at Lower East gallery Anastasia Photo, and in June her more signature works, which she calls 'bright and happy pieces,' go on display at the gallery connected to Rebecca Minkoff's LA store. . .